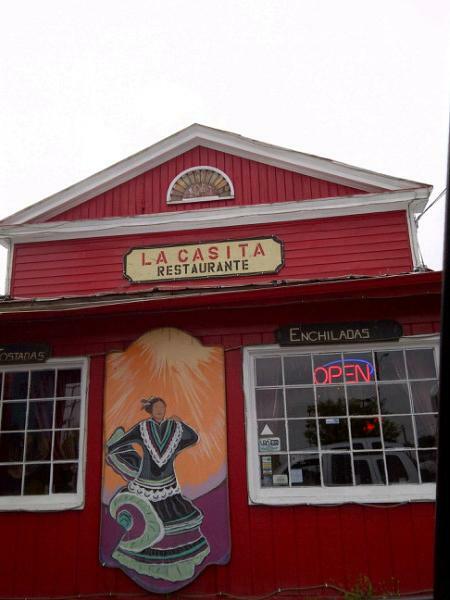 La Casita – fake Mexicans? Who cares that it’s not real Mexican food? There are Christmas lights hanging everywhere inside this place. That counts for something. The friendly Russian woman who seemed to be in charge may have labored a little to pronounce “burrito” and the other items on the specials board. Awesome. Finding new places to eat in Richmond is still exciting for me. I’ve lived in the city for 2 years now and I have had the opportunity to eat at lots of restaurants here. Some of them are good because they serve great tasting quality food despite very humble or unconventional appearances. La Casita is one of those. I am familiar with “authentic” Mexican food. La Casita, by most measures, doesn’t serve that. They do, however, serve good food. You can get lunch here for under $7 and the specials change daily. This “Burrito Michoacano” from La Casita on Brook Rd. for $6.95 gets an ‘A’. This place looked too cool to pass up. I eat at La Casita a couple of times a month and almost always get the special (I’ve been through the menu at least once) I really like it. They are friendly the food comes out fast and as you point out it’s good. Where did that white sauce come from? Only in Richmond. I don't really get the white sauce thing either – and I had never seen it before I moved to Virginia. I love their chicken fajitas, but the main reason to keep coming back to La Casita is their yummy homemade red salsa. AMAZING! This place rules! And I hope you don’t mean any offense by the fake Mexican remark, because IMHO it’s some of the best Mexican food you can find in Richmond. If you’re really trying to save money, order off the a la carte menu. No other place has been doing it this well since 1980. As I hope is evident in my post about this restaurant, I certainly don\’t intend any offense.